Among the many legends of humankind are legends of “imaginary” creatures called “demons”, whose nature is to behave in an evil way and commit evil acts. 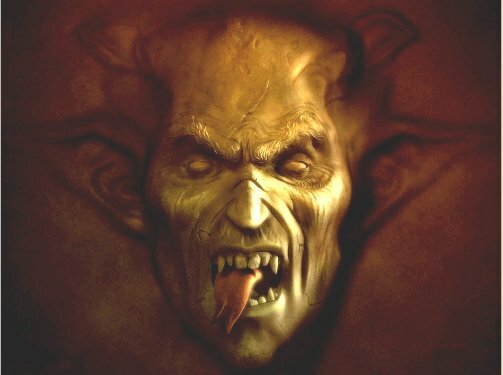 While demons are depicted in many different shapes and forms, there is a common “look” to the head and face of a large number of the depictions of demons. That common look is called “The Face Of Evil” by Happeh Theory. 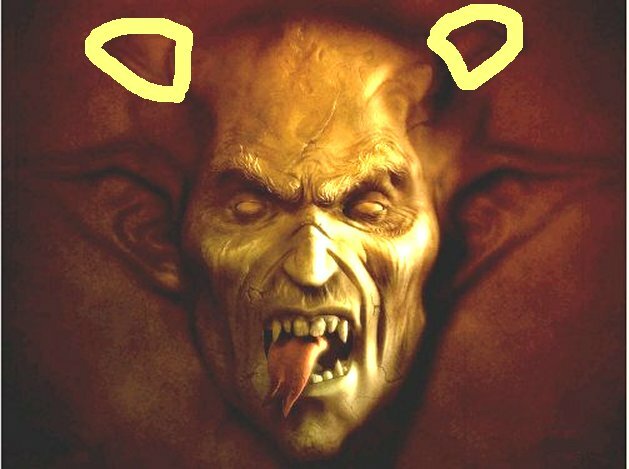 The next picture shows one of those common depictions of a demon face which exhibits the characteristics that define “The Face Of Evil”. Please take a moment to observe the picture on your own to form your own impression of the significant features of the face. and the pair of horns sticking out of the head. 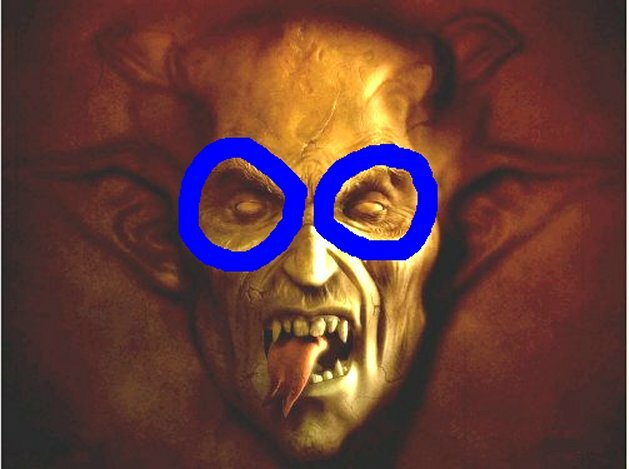 Why is “The Face Of Evil” characterized by large eye sockets, a wide open mouth, and a lolling tongue? 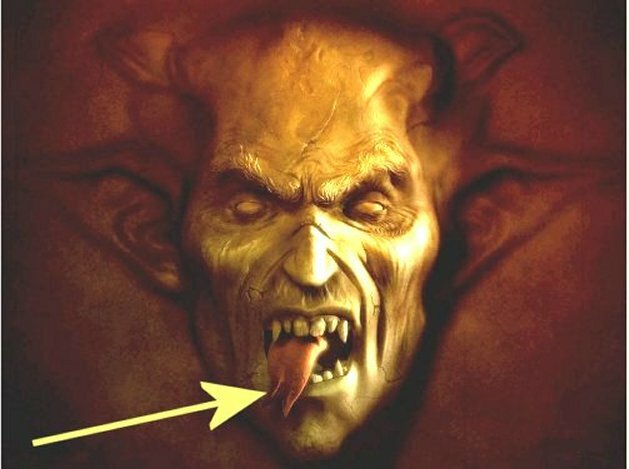 If demons and “The Face Of Evil” are just imaginary creations, artists could draw or paint them any way they liked. Why were large eye sockets, an open mouth, and a lolling tongue used to create “The Face Of Evil”? Because according to Happeh Theory, “The Face Of Evil” is not an imaginary creation. “The Face Of Evil” is the result of observation of creatures who behave in an evil way and commit evil acts. According to Happeh Theory demons are not legendary creature. Demons are actually human beings whose bodies and behavior have changed in a particular way. According to Happeh Theory, over the course of history human beings noticed that certain members among their group had a propensity for evil behavior and committing evil acts. They also noticed that some large number of those people all had a similar look to their face. According to Happeh Theory, the legends of “demons” are actually factual information about certain types of human beings, how they behave, and how they look, that was deemed important enough to pass on to future generations like passing on knowledge of how to make fire or how to build a house. The knowledge was packaged in the form of “legends about demons” instead of perhaps a serious book on the subject, because human beings from ancient time were more simplistic, and because any method of writing something down was vulnerable to destruction over time spans of hundreds of years. By passing the knowledge on through legends, those ancient human beings would ensure the knowledge would be kept as long as human beings wer alive to pass on the knowledge. Those claims, like many of the claims made by Happeh Theory, may be difficult for the reader to accept. There is evidence available to support that claim, as there is evidence to support the other claims made by Happeh Theory. 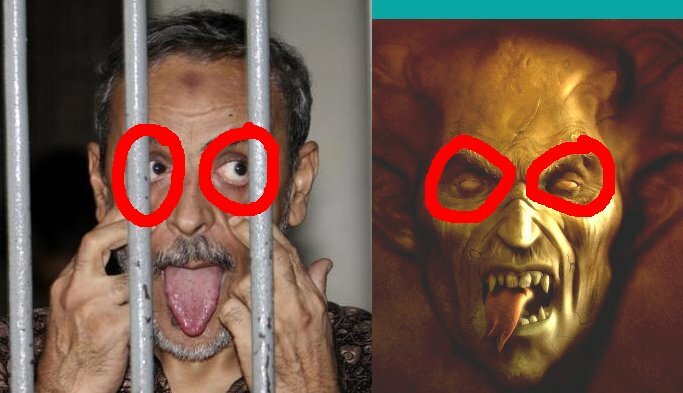 The evidence available to support the claim that “demons” are really human beings whose faces have a characteristic look is the face being made by the man in the following picture. The man in the picture has been jailed on accusations of financing terrorism. The man is making a face by pulling down his lower eyelids and sticking his tongue out. According to the original caption for the picture, the man is “joking with a journalist”. Does that seem logical to you? Why would a man who was arrested for financing terrorists, jailed against his will, and being photographed like an animal in a cage, be joking with a journalist? Doesn’t it seem more logical the man would be angry he was being detained, and contemptuous of his captors? Wouldn’t the presence of those two emotions make it seem more likely the man’s motivation for making the face would be to display his anger or contempt of the individual taking the picture? According to Happeh Theory the man is making the face motivated by anger and an urge to ridicule the photographer. The basis of that statement is that the face the man is making is “The Face Of Evil”. 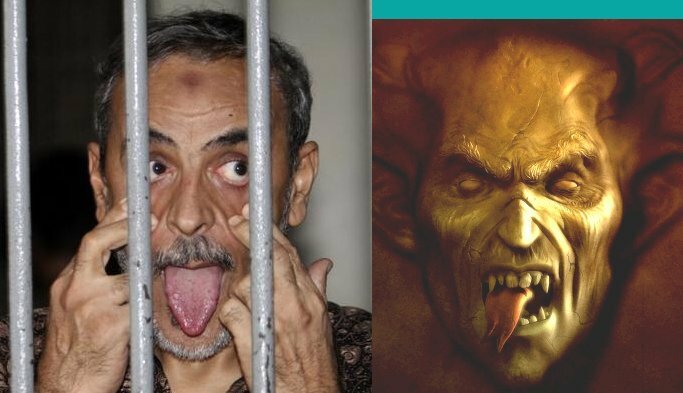 Here is a comparison picture of the man in jail and the artist’s rendering of a demon. and he has made his eye sockets look big like the demon’s. 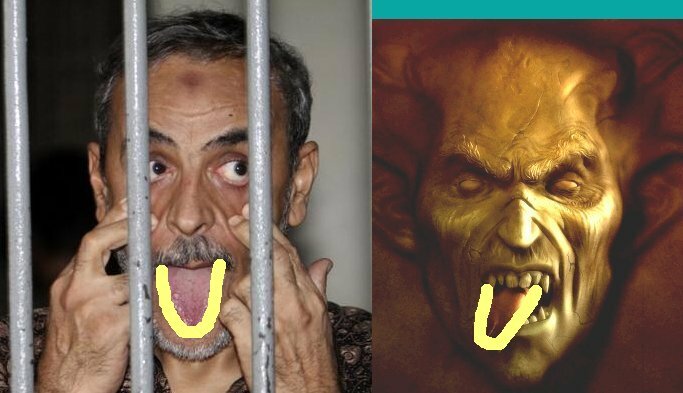 Why is the man in jail making a face that just happens to look like “The Face Of Evil”? 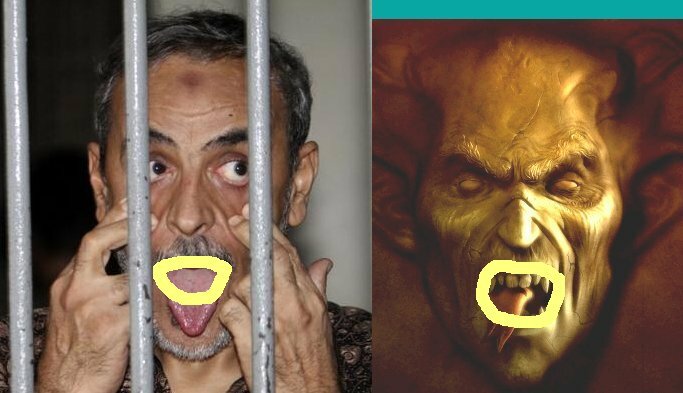 Because as this blog entry has claimed, this man was taught or learned in some other way what the characteristics of “The Face Of Evil” are, and he is making “The Face Of Evil” to taunt and ridicule his captors. The man believes his captors and the photographer taking his picture are the type of human beings that this blog entry claims the legends of “demons” are meant to be a warning about. That belief on the man’s part that his captors are the evil behaving and evil acting type of human beings that the legends of demons are meant to be a warning about, would also explain the man’s supposed support for terrorism. If you knew there were actual “demons”, an actual type of human being that behaves in an evil way and commits evil acts, would you be motivated to fight the “demons” in order to protect the good people of the world? I’d like to know where you found the picture of the demon you used in your article. It looks exactly like what I saw when I was younger and scared me obviously. I had never seen another rendition that came close until I saw this picture. How do you know the man isn’t possessed by a demon and is simply doing what the demon is compelling him to do? I have a photo of Charles Manson and many others which look exactly like that. And if anyone is possessed, Manson certainly seems to be. This does not mean demons do not exist. Your reasoning likely holds some validity. But there are no real logical grounds to dismiss the existence of demons. because a person can come to look like the demon they are possessed by. Demons, gods, angels etc. are not real creatures but embodies of human’s personality traits. It’s just natural that ppl are expressing their moods, feelings, behaviors, acts etc. thru art. When ppl allow themselves to think and feel more rational way, all this superstitious crap is so understandable and clear. And shameful.